During the Olympics, we were assigned into teams (countries) and from that we had to create a site about our country and write a bid to the IOC on why our country should hold the next Olympics. This is a link to our site but this is our Bid. The year 8 girls in Whanau Panuba created a poster to show our understanding of being a future focused leaner. This is a movie of us talking about the meaning of our poster. Recently in extension, we have been learning and researching about tattoo symbols and what they mean. We also got to look at the traditional Samoan tattoo - “Tatau or Pe’a”. Just last week we were lucky enough to have Mr Tele’a come in to talk to us about his own tatau/pe’a. He gave us a very specific understanding about it. He also explained what his tatau meant. I remember him telling us that if you were to put a tatau onto a big piece of paper and unravel it, it would end up looking like a flying fox/ bat hence the name “Pe’a”. * Faavaetuli - (the tuli's footprint) - the tuli was the bird of the supreme Atua, Tagaloalagi. * Faaatualoa - (centipede) - believed to be one of a god of the past. * Faalaupaogo - (panadus leaf) - one of the important plant to the Samoans. * Faapepe - (butterfly) - one of a useful insect to the Samoans. * Faaupega - (net) - very useful for fishing - for Samoans everyday need. * Faaanufe - (caterpillar) - a symbol of a new life to a Samoan man. Every part of the tatau is significant and has meaning, but two parts that Mr Tele’a explained as very important to him were his belly button and the va’a (also known as the canoe).The canoe is a 20-30 cm wide black strip that goes across the back with arrow points at both ends, going towards the front under arms. This represents the family of the tatau wearer must protect. And the belly button is significant to him because it was the last part that was done. Now, we have to design our very own tattoo’s that are made out of two design. One has to represent our family and culture and the other has to represent ourselves. Right now, I am still working on deciding on my final design. I am looking forward to learning more about the Samoan Tatau. A few weeks ago, the year 8’s went on a two hour drive up north to Marsden Bay camp. On our way there we stopped off at Langs beach to take a break and to stretch our legs. After a short break and some morning tea, Ms Squires told us that we were going for a long refreshing bush walk. “Yes,” I thought then realized that she said its going to be long. Our bush walk had all the features of an “Adventure.” There was mud, rain, and even more MUD. The mud and rain caused a lot of slips and slides that made most us to fall. Just about everybody came out of the bush walk with battle scars. Most of the other kids thought it was just down-right dangerous, but without the danger factor, it wouldn't have been one of my favorite about camp. My favourite thing about camp was the last night we spent there. Our groups had to prepare a short song to share with the rest of the groups at the camp fire. Our team - Marsden - did a remix of a couple of different songs and a marching in song that helped us score more points for our team. It was a very fun night! Another highlight of camp was getting to spend a whole week with my friends and also the year 8’s I don’t normally hang out with. From this camp I am going to take away a lot, from learning how to keep safe in the sun to a lot more friends. This term our class had to re-create our avatar's and incorporate something that represents you, your house colour, and your name or your initials. This is mine. My initials are LTNM and my house colour is 'Te Arawa' (the red house). 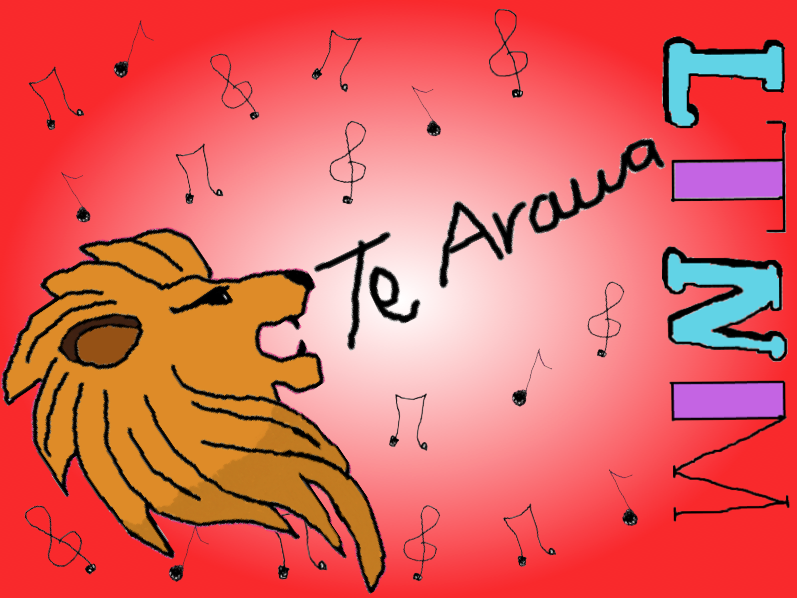 Last but not least are the music notes, they obviously represent music, and a Lion because my star sign is Leo. First, it seemed like another ordinary first day of school, (arrive at school, then go to assembly) and then after assembly, Mr Barks and Mrs Nua announced that our class was going to collaborate with Class 5 to make a new big class for the term. At first it was weird, but then as the day passed, we all got used to the idea of a 'New Whanau'. As the term goes by, I would like to see both our classes bond like a family. I think it'll be interesting to merge with another class this term. It is a good way to start of the term and end the year. As part of our school topic - "Game On" - we had to research a unique game that we could teach to the rest of the senior block. The game I found was a game named 'Ano'. Hopefully this will help you understand what it is and how you play it.